Boo did this chart scare you? 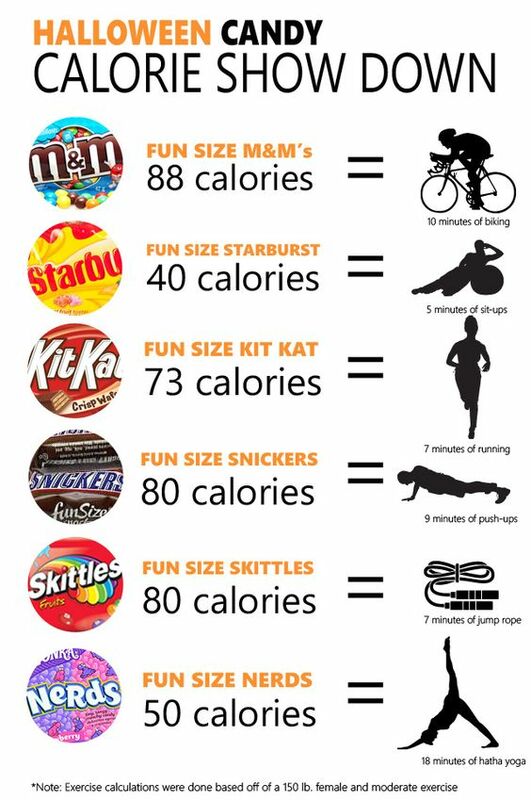 Give or take this chart is pretty accurate as far as the activity needed to burn off a “fun” size candy that you soon take over your house and your mind. “I’m only having 1 piece” “Ok, one more” “F@#$ it, I’ve already had 2, might as well keep going”. Want to know something even scarier? Between Halloween and Valentine’s Day, American’s will gain an average of 7lbs. 7. What? It’s an average, some people will lose but others will gain MORE than 7 and it starts with this fun little day. It’s inevitable that you are going to have some candy today but it’s your mindset that makes all the difference. Halloween is 1 day, not 2 weeks and you need to repeat that to yourself all day. This is one day where the treats are flowing and it’s hard to turn them down but below are some tips on how to handle the rest of the candy laying around from now until Thanksgiving. Candy shouldn’t replace a meal, try to plan breakfast, lunch, and dinner as your normally would. You could eat lighter at those meals but you should still eat them. Before you eat 1 piece of candy, ask yourself “Did I eat anything with nutritional value yet today?” If that answer is no, put down the candy and pick up an apple. Try to still get in those fruits and veggies. I recommend a green smoothie as a meal and pack them all in. You can find a recipe for a great one on my page. Don’t waste calories on something unless you are going to enjoy it. Whether you prefer Reese’s or Sour Patch Kids, eat the one that you want and don’t mindlessly eat something. Bring some food with you if you are going Trick or Treating tonight. I myself am packing a peanut butter balance bar. It’s a long night and I know that will fill me up and satisfy that inevitable sweet craving from seeing all that candy. Starting tomorrow, put the candy away. If you have leftovers from your house for the Trick or Treaters, give it away, bring it to work, throw it away. You don’t need to keep a ton of candy lying around. If it’s your kids candy, put it out of sight and before you eating any, re-read the first paragraph about 7lbs.